Tomorrow is the sock design class at UnWind in Burbank, CA with Cookie A. We are to bring in stitch patterns to use to design our own socks. 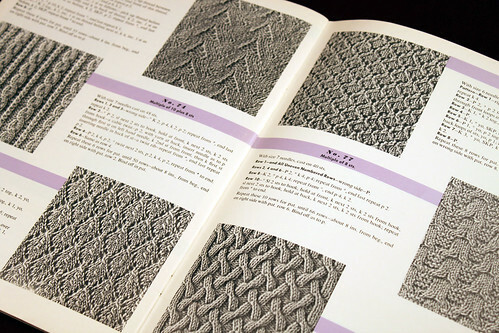 I thought I found some really great stitch patterns in the two Japanese Let’s Knit magazines I have. That lasted until I went on Ravelry yesterday and was looking at the April KAL thread photos in the Sock Innovations group. Cookie has already published sock patterns using the stitches in the Let’s Knit books. In the first photo below the sweater on the left is the stitch pattern Cookie used for her Twisted Flower Design. The next photo is the stitch book I bought when I was working in the Needlework department of Marshal Fields in 1979. In it the stitch for Monkey is next to a different version of the Glynis stitch. They are at the top of the page. I will try this version of the Glynis stitch when I knit up more of the self striping yarn I bought on sale. It is a simpler stitch pattern without the K3tog. There is the same amount of decreased stitches only they are placed over two rows. There is no plain row between pattern rows like in the Glynis pattern. I sometimes forgot that plain row and had to tink back. This stitch should eliminate that too. Some of the other stitch patterns on these two pages would also make cute socks. 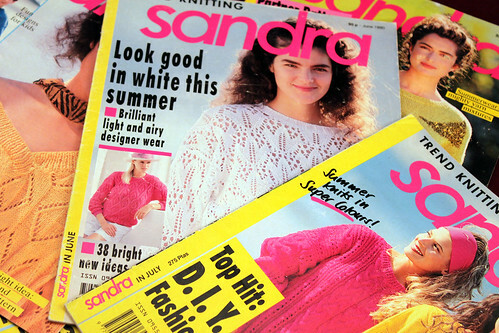 Then I thought about a few old Sandra magazines I bought in 1990 and 1991. Finally I think I have found some knit stitch patterns that will make unique socks. The stitches are presented in charts which should be a help in designing process. I bought the magazines for the crochet patterns. 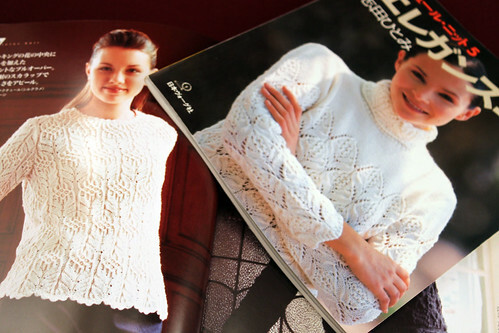 There are lots of lace knitting patterns too. Now I just need to choose one pattern. There are so many that would work. This entry was posted on Saturday, May 2nd, 2009 at 3:00 am and is filed under Knitting. Tagged: Knitting. You can feed this entry. You can leave a response, or trackback from your own site. Looking forward to seeing what you come up with and your feedback on your class with Cookie!